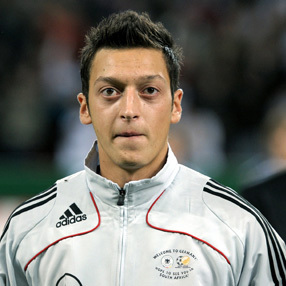 Mesut Ozil – the Greek, er… German God of Assists. One of the key tenets of teambuilding philosophy in the modern age is this: Find traits that are undervalued in the marketplace that also lead to wins. Buy those players as cheaply as possible, put them in a system that works, and hopefully it will lead to a title. Billy Beane did this with the Oakland A’s by emphasizing walks and power at the cost of defense and athleticism. Getting on base – however you do it – equates to runs. They just found guys who got on base in unflashy ways (via boring old walks), plugged them into the lineup, and let statistics do their work. Assists are the game of football’s walks. But what about an assist? Assists are just passes with a goal attached to the end of them. Hrm… flip that around. Assists are goals that resulted from a pass. Now the relationship is obvious. Take one step further back in the relationship and you see the statistic called Key Passes. Key Passes are Schrodinger’s Goals. In the moment before the ball is struck in the penalty area, that ball is probabilistic. It exists as a goal, a save, a deflection, a shot completely off target, a shot off the woodwork, and a block all at the same time. Then, once the ball is struck for a shot, that moment is resolved and we find out what that pass actually was. And the chance that that pass will be a goal is higher than almost any other single event you track in a football game. Comparisons to cats who are both alive and dead aside, the important bit is that a key pass equates to a very good goalscoring chance. The more good chances your team creates, the more likely it is that they will also score goals, and the more goals you score, the more likely you are to win. Simples. Now why do we care about this? First, because other teams don’t seem to value this trait (or these stats) enough, which means we can add potential wins to our team on the cheap. Second, because the ability to deliver key passes is repeatable season after season (meaning you are less likely to spend a bunch of money on a failure). And third, because this trait – especially when shown by young players in top level competition – is a very strong indicator of future greatness. Obviously there are a couple of duds in there (Wayne Routledge and David Bentley spring to mind), but holy hell there are a lot of good ones as well. 22 of the 35 have already ended up as starters for league-winning and Champions’ League semifinal teams. The frustrating thing is that all of these numbers are just from season-end stats. Looking at rates per 90 minutes played is far more valuable and interesting (and even more likely to unearth hidden gems), but that information doesn’t exist publicly. A guy like Yohan Mollo, who produced a 3G/6A season in Ligue 1 last year over 18 starts doesn’t show up immediately there, but his per 90 rate was great. This year he’s got 7G/13A in 35 total matches (at age 23), a tremendous return. One interesting thing for the skeptics to ponder before I go. Look at the list above again, and note that Chelsea own three of the players on there (Mata, Hazard, Marin). Bayern Munich now own four (Götze, Robben, Muller, Kroos). Two of the richest, most successful teams in the world are clearly valuing guys who produce high levels of assists at a young age, in large part because this is the modern attack. You need creative guys who can run make runs, fill space, and have the vision to produce great final balls. Pair them with efficient finishers, and the combination makes it exceptionally difficult for teams to mark you in the attacking third. These types of players exist around the world – the trick is in knowing what matters, getting the data on it, and then finding the players that fit your budget. If you do that, and you have a manager whose system can exploit them, your team will win more. Tomorrow: Back to trawling for value. Post Script: Marko Marin had three 9+ assist seasons by the age of 22. The past two years haven’t gone well for him, but if he gets playing time, I think he will be really impressive.